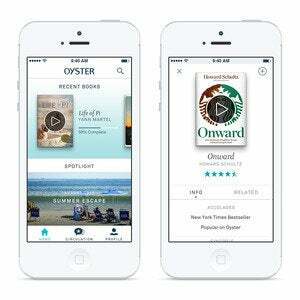 For years, people have dreamed of a “Netflix for ebooks,” and now a startup called Oyster is making it happen. Oyster offers subscription access to more than 100,000 books for $10 per month. It’s an invite-only service for now, with requests fulfilled on a first-come, first-served basis. Subscribers can access their books through an app for iPhone and iPod Touch, with an iPad app coming later this fall. The app supports offline reading, and while Oyster is only available to U.S.-based subscribers, users are still allowed to read their books outside the country. Unfortunately, Oyster hasn’t set any plans to offer apps for Android or other platforms. Oyster isn’t exactly the first company to offer subscription-based ebooks. Amazon, for example, offers a “ Lending Library” of books to Amazon Prime customers, but users can only check out one book at a time, and can only access the book on a Kindle e-reader or tablet. Other companies, such asBookboard and Speakaboo , sell subscriptions to ebooks for children. Booksfree offers a subscription for physical books, but not digital ones. But Oyster is the only company to offer a broad selection of ebooks without any restrictions on how many ebooks users can check out or read. In that sense, it’s the most Netflix-like ebook service yet. Not surprisingly, most publishers are dragging their heels on the subscription concept, just as they did with ebooks themselves. Right now, Oyster only offers books from HarperCollins, Houghton Mifflin Harcourt, Workman and Smashwords. Three of the “big four” book publishers—Simon & Schuster, Random House and Penguin Group—aren’t participating. “Some authors and publishers are not yet working with us to make their books available on Oyster,” the service’s FAQ page says. “We hope to work with as many authors and publishers as possible in the future.” Oyster also notes that it may remove books due to rights-related issues, and that new releases generally take a few months to show up on the service. Still, as GigaOM points out, Oyster has a fair share of bestsellers, including Water for Elephants, Life of Pi, and Lord of the Rings. It’s early days for this kind of service—for skittish publishers, there’s obviously a balance to be struck between the subscription model and standalone sales. Hopefully publishers will warm to the idea of a Netflix for ebooks, just as the film, television, and music industries embraced subscriptions in their own ways. There are too many good books that are being left unread. This story, "Oyster offers all-you-can-read ebooks for $10 per month" was originally published by TechHive.